This issue marks the debut of our new Game Changers series. It’s Vanguard’s way of celebrating the innovators and trailblazers in the in the industry. For this first installment, we feature our interviews with six select executives and entrepreneurs who are leading the way in their respective sectors. This is just the beginning of several other new things we will be introducing in our succeeding issues. We definitely like to get your feedback about Game Changers, so check it out and tell us what you think. This year, February and March are truly very busy months for the industry and the country as a whole. While working on this issue, we continued to get updates on naval procurement challenges. We heard everything from tugboat troubles to reported faulty Coast Guard vessel designs, issues around the NSPS and the resurrection of the armed forces’ Joint Unmanned Surveillance and Target Acquisition System (JUSTAS) better known as the military’s drone program. 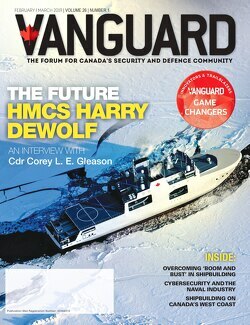 Great timing, because this issue of Vanguard Magazine takes a look at the use of technology in the military. Contributing writer and aircraft enthusiast Chris Black discusses the advantages that drones can provide the military in his article Droning On. Among the other tech-focused pieces we have in store for you includes a C4ISR analysis by Sheila Mason, director of PwC’s technology advisory practice. Her article, C4ISR: where are the wearables? is a very engaging document that could serve as a primer for understanding big data and the Internet of Things and how they fit into the military space. Ken Hansen tackles the problem of how to plan for future defence forces in a global environment where technology now plays a critical role in enhancing the capabilities of even the smallest adversaries. Our Dashboard Section is always handy for a quick glance at the facts. For this issue, Dashboard also takes a look at drones. Vanguard Editor, Nestor Arellano draws you a picture of what Canada’s soldier of tomorrow will look like in his article about the Integrated Soldier System Program. Perhaps the biggest news to come out in the last two months was the Liberal government’s pullout of the Air Force’s CF-18 fleet from the battle against ISIS and the revamp of the military’s anti-terrorist strategy to a more training and humanitarian-focused mission. Vanguard’s Last Word section examines this issue.